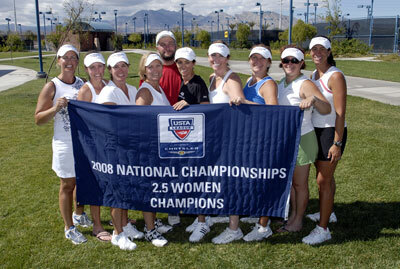 LAS VEGAS (Oct. 5, 2008) - The women’s team from Haverhill, Mass., representing the USTA New England Section, captured the national title at the USTA League presented by Chrysler 2.5 Adult National Championships held at the Amanda & Stacy Darling Tennis Center in Las Vegas. The Haverhill team defeated a team from Pensacola, Fla., 3-0, in the Championship match. Earlier in the day, the Haverhill team defeated a team from Belgrade, Mont., 2-1, in the semifinals. They advanced this far by winning their round-robin flight contested Friday and Saturday. The team is captained by Igor Korik and features Juliann Murphy, Sheryl Rose, Natalie J. Bojas, Lyuba Michel, Madeline Kelly, Janet Nork, Liz Morin, Jacquelyn Santini and Merritt S. Clancy and plays at the Willows Racquet Club. The top four teams in order of finish are: Haverhill (New England), Pensacola (Florida), Belgrade (Intermountain) and Guaynabo, P.R. (Caribbean). This year’s USTA League presented by Chrysler 2.5 Adult National Championship has drawn the top 29 teams, 12 men’s and 17 women’s, from throughout the nation.